Overnight, Swarovski emailed Swarovski voucher codes to some people on their email list. The voucher is good only on cyber-Monday. This Swarovski discount can be redeemed for a $20 credit toward a Swarovski crystal purchase exceeding $150 on November 29, 2010. I’m not sure who all received the discount Swarovski voucher. I am an active Swarovski SCS member and I purchase a couple Swarovski crystal figurines online each year, yet I did not receive the voucher. Another family member, with an expired Swarovski SCS membership, did receive the voucher coupon. Additionally, another family member, with an expired Swarovski SCS membership, did not receive the voucher coupon. To me, it does not matter how Swarovski determined the Swarovski coupon recipient list, I’m glad to have any coupon to be able to save $20 on shopping. Keeping with the cyber-Monday spirit, Crystal Exchange America is also offering one-day shopping discounts. At www.crystalexchange.com , Swarovski collectors who purchase $300+ in Swarovski crystal and checkout using the shopping cart system, can save money too! The discount Swarovski codes are as follows: buy $300+ and save $20 using coupon code CYBRMON20 during the checkout process. Buy $500+ and save $30 using coupon code CYBR30MON during the checkout process. Swarovski discounts only apply to orders placed on November 29 with the appropriate coupon code entered during checkout. It is are NOT valid on fax or phone orders. Vouchers are limited to the first ten redemptions for the day. Happy Holidays and good luck shopping cyber-Monday to all Swarovski Crystal collectors! Swarovski is now its second round of online weekend events. This weekend’s Swarovski Limited Edition feature is the Laser Pendant and Earring set. Just as the first weekend, this feature set is limited to a quantity of 500. The Swarovski Laser set is available online beginning Friday November 26 and ends when stocks are depleted or in the evening of Sunday November 30, whichever comes first. Based on the images and information found at the Swarovski web site, I believe that the necklace and earrings are made of a silver-tone metal and each contains a single clear Swarovski stone. While not stated in the product description, the earrings are for pierced ears. I don’t know if it is possible to purchase this Swarovski Limited Edition with clip style earrings from Swarovski’s standard product line or not. This beautiful Swarovski Limited Edition Laser Pendant and Earring Set has a price tag of $100. The Swarovski System Number is 1083010. Standard shipping is free to USA residents (since the price exceeds the minimum order of $95 to obtain free shipping). Crystal Exchange America does have a selection of retired Swarovski necklaces, Swarovski earrings, Swarovski bracelets, Swarovski pins, and Swarovski brooches. Swarovski jewelry has a much slower turnover since it is not ‘collected’ like Swarovski figurines. Many Swarovski collectors have either seen, heard of, or own the Swarovski Maxi Swan. It is a massive piece of crystal, measuring 6.5″ high and weighing in at nearly 6.5 lbs. But the Swarovski crystal Maxi Swan would look like a cygnet in comparison to the creation for the Toronto Santa Claus parade, which was held November 21, 2010 in Toronto, Canada. Swarovski commissioned a truly gigantic swan float for the event. It is over 8′ tall and adorned with hundreds of thousands of tiny Swarovski stones. The Swarovski float decorator states that she spent 41 hours applying the 22 litres of stones to the float. She would pat handfuls of the Swarovski stone glitter as a time to the swan structure. It must have been a very shimmery swan and had an over-the-top WOW factor in it! I’ll be on the lookout to see if Swarovski does more floats in holiday parades. This piece would be very unique for Swarovski crystal fanatics to have in their collection! By the way….where would you park this thing???? Swarovski has begun a series of online weekend events running for four weekends. Today is the last day of the first weekend Swarovski event. The online limited edition is the ‘Mozart Limited Edition Pendant’. This necklace is a gold tone heart-shaped cutout handing on a gold-plated chain. The heart is embellished with Swarovski Golden Shadow crystals. Based on the original advertisements, the quantity was supposed to be a limited edition of 500 units which are only available in the Swarovski site. When I visited the Swarovski store page for the necklace, I was still able to add the item to my Swarovski cart, so I concluded that these Swarovski Limited Editions has not yet sold out. This is good news for all Swarovski collectors who wish to purchase, but have not yet done so. If anyone misses the opportunity to purchase, either because the Swarovski Mozart Limited Edition Pendant becomes sold out, or the deadline is missed, Swarovski does make a very similar pendant. The pendant design is identical, the differences are that the standard Swarovski Mozart Pendant is silver-tone in color and has clear crystals inset. 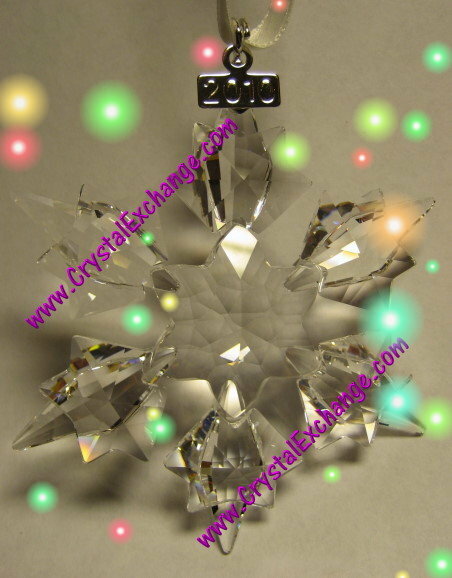 Crystal Exchange America does have a selection of retired Swarovski pendant, Swarovski necklaces, Swarovski bracelets, Swarovski brooches, and Swarovski pins. As Swarovski jewelry is not ‘collected’ like figurines are, these items have a much slower turnover. One of my clients asked me about purchasing what she called the Swarovski Corvette. I did some detective work and finally found the Swarovski Corvette she was asking about. The Swarovski Crystal Corvette is a limited edition die cast model Corvette bejeweled with approximately 5300 hand-set Aurora Borealis Swarovski crystals. This brilliant, sparkly sports car is a limited edition piece, with only 500 units produced. The Swarovski Corvette is available exclusively through the Franklin Mint. The Swarovski Ultimate Corvette is 1:24 scale. One web site indicated a December release date, just in time for the holidays, and pre-orders are presently being taken at the Franklin Mint site. This limited edition has a nice price tag of nearly $1300 which can be made in 3 easy payments to the Franklin Mint. For Swarovski Crystal collectors who may be interested in a cheaper Swarovski car, Crystal Exchange America does have several different ones available on their web site: Swarovski Limited Edition Porsche 356, Swarovski Porsche 911, and Swarovski Porsche Caymen . The Swarovski Porsches are typically in the $400 – $800 range. And if the Swarovski Porsches are still too pricy for a car gift, there’s always the Swarovski Old Timer Automobile which normally sells in the $125 – $200 range. Swarovski is breaking new ground doing a series of online Swarovski events! Swarovski has designed and produced 4 unique pieces of jewelry to be offered to Swarovski collectors. The online events will start Friday, November 19, and run for 4 consecutive weekends. According to Swarovski, newsletter subscribers may get a hint as to what the limited edition Swarovski jewelry pieces will be in advance of the event weekends. The event is open only to the 22 countries which presently offer online Swarovski shopping. The United States and Canada are among the 22 included in this special shopping opportunity. Swarovski collectors in the United States can use this link: Swarovski Newsletter to receive further details and reminders. Whether you are serious Swarovski crystal fanatics or casual Swarovski collectors, you won’t want to miss this opportunity to secure your limited edition Swarovski jewelry. This would be a terrific chance to get that special someone a gift that you know for certain would be a crystal treasure in years to come. More information coming soon at the official Swarovski web site: www.swarovski.com . The annual Swarovski 2010 Ornaments are readily available, and by purchasing them well in advance of the holidays, Swarovski collectors are guaranteed the widest choices at the most reasonable prices. The silver crystal, annual edition Swarovski 2010 Ornament is a stunning design. As tradition stands, it does resemble the unofficial Star / Snowflake motif. 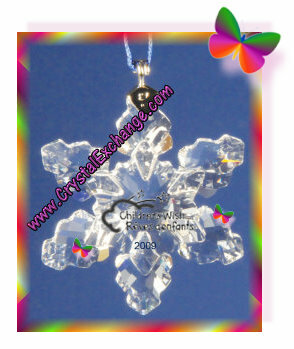 According to the Swarovski web site description, it is a clear crystal snowflake, hung by a white satin ribbon, with a silver-tone metal tag inscribed with 2010. The dimensions are approximately 2.5″ wide by 3.25″ tall. 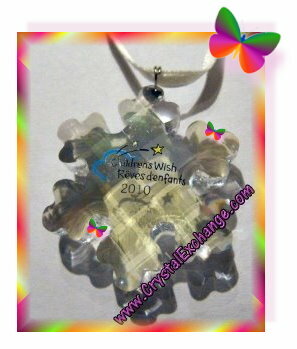 And if you like this ornament, you’ll simply love the SCS Swarovski 2010 Ornament. The SCS Swarovski figurine is identical to the silver crystal 2010 ornament, however, it is ‘golden shadow’ in color and hangs by a cognac-colored satin ribbon. This is a Swarovski Club release and does require SCS membership when purchased from an authorized retailer or directly from the Swarovski web site. Another limited edition Swarovski ornament that is observed less frequently is an exclusive Swarovski 2010 ornament with red tips. It is a 6-pointed snowflake ornament. The center part of the ornament is clear cut crystal, with the 6 points highlighted in light siam crystal. “2010” is engraved on the front, and the familiar Swarovski swan is imprinted on the metal tag. The ornament hangs from a red satin ribbon and the ornament is packaged in the traditional Swarovski blue packaging. The Swarovski artist credited with the design is Verena Castelein. 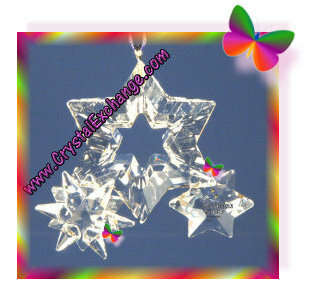 Most Swarovski collectors will tell you that Swarovski ornament designs are similar in nature to stars or snowflakes. Oftentimes, Swarovski collectors refer to the annual edition ornaments as Swarovski star ornaments or Swarovski snowflake ornaments. 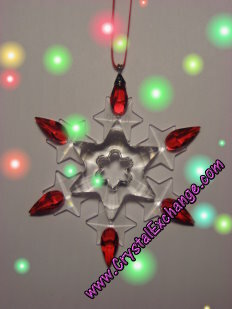 Since 1991, Swarovski has produced annual edition star / snowflake ornaments to compliment its holiday product offerings. The Swarovski crystal ornament design has been similar since inception. For each year, the ornament year is imprinted on a metal tag attached to the ornament hangs by a satin ribbon. The Swarovski ornaments have 6 to 12 crystal extensions creating a graceful image that shines and sparkles in the light. The packaging for the crystal ornaments is a triangular box, with paperwork included that is specific to the ornament year. 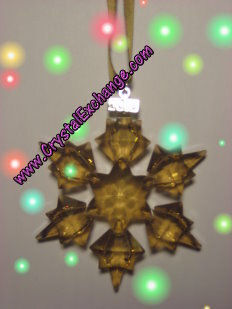 Many retired Swarovski ornaments can be found at Crystal Exchange America’s web site: www.crystalexchange.com . We do have a good supply of listings now. However, with the holiday shopping season now upon us, supplies will diminish, and prices will increase. Whether you are planning to purchase one of the 2010 Swarovski snowflake ornaments or a retired ornament, get your order in soon! Swarovski has introduced another Limited Edition Swarovski figurine. The crystal figurine is the Swarovski Limited Edition Golden Rabbit. The Swarovski system number for the item is 1046377. This Swarovski figurine was produced for the collecting community in China only. According to the ebay ads I read, the figurine has the inscription “Limited Edition 2011″. Good luck bidding if you looking to aquire this Limited Edition Swarovski figurine! Christmas trees are a holiday tradition for many in the USA. Swarovski offers crystal ornaments to display on or off the Christmas tree each year. Swarovski designs and produces a Swarovski Star Ornament / Swarovski Snowflake Ornament, and a variety of other ornaments including angels, candy canes, stocking, Santa hats, and more. The celebrated Swarovski Christmas tree will again be on display featuring lovely, sparkling Swarovski ornaments. In the USA, the stunning Swarovski tree can be found at Rockefeller Center in New York, New York. The grand Swarovski Star will be raised on November 18, 2010. The Tree Lighting Ceremony will be held November 30, 2010. Swarovski has created the top star on the Rockefeller Center tree since 2004. The first lit Swarovski ornament star was in 2009. This video clip shows the 2009 star. So …Swarovski crystal fanatics, save the date for this beautiful event! I envy all Swarovski collectors who are lucky enought to be there! Swarovski Crystal figurines are always an excellent gift for avid Swarovski collectors. If you plan to give you your special someone a new Swarovski release, you should consider using the Swarovski Gift service. Swarovski’s Gift service allows shoppers to select the delivery date, pick the packaging, and include a personal greeting. How convenient is that! 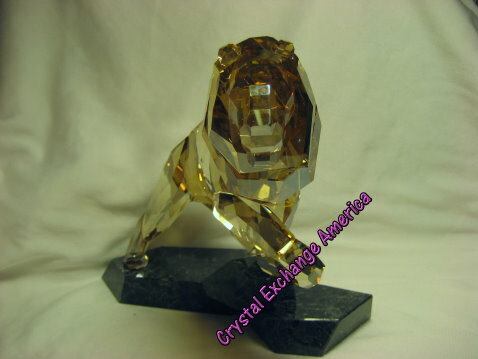 Crystal Exchange America has a large selection of Retired Swarovski. While they do not do gift-wrapping, they can help plan the delivery date. 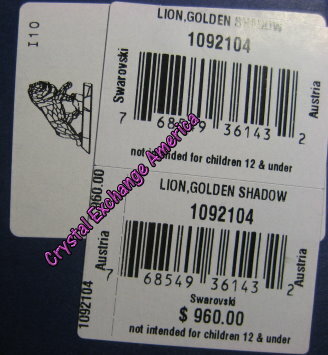 If shoppers are uncertain on which Swarovski figurine to purchase for the Swarovksi collector in their life, Crystal Exchange can make recommendations to consider. Their best advice is to shop early to get the widest variety of selection at the lowest prices. Hopefully, all shoppers will find the right Swarovski crystal gifts for their loved ones this holiday season! 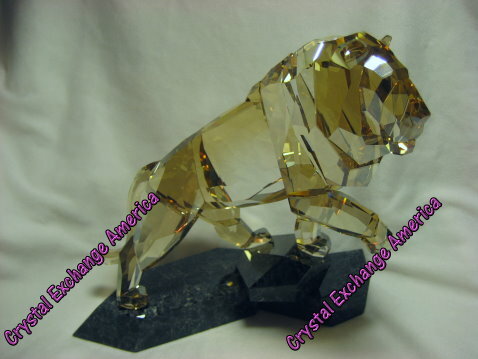 The rare Swarovski Hong Kong Art Object crystal is on ebay now! This Swarovski Limited Edition originally retailed for approximately $1100 and stands just over 12″ tall. Only 1997 crystal figurines were produced, commemorating the transition of Hong Kong. Each Swarovski Crystal figurine was individually numbered. This ebay auction has a starting bid of $765, so it seems likely to sell. Check out the auction for the Swarovski Hong Kong Art Object that ends on November 11, 2010. Good luck to all ebayers bidding!